While some travelers feel that vacations are time to disconnect from technology, or take a “digital detox,” most people don’t actually unplug. When we asked travelers about their wish list for their hotel stay, the majority of people said “free WiFi.” In fact, millennials will choose a hotel based on “Instagram-worthy” de?cor, pointing to their desire to be connected to social networks while vacationing. This need for connectivity also speaks to continued planning during a trip. Travelers frequently use navigation apps while traversing a new city, or apps like Yelp and OpenTable to figure out where to eat. The dependency of technology has removed spontaneity from travel - open-ended exploration has been replaced by people moving through destinations based on their popularity and share-worthiness. But research and anecdotal stories show that spontaneity is good for us. There is still nothing that quite compares to the thrill of discovering a gem by happenstance. wish they were more spontaneous, while 30% said they wish they were more of a planner. Most will accept a nudge to be more impulsive – as 73% of individuals said they would be willing or very willing to receive text messages about unplanned excursions, dinners and other experiences while on vacation. So what kind of useful tips can brands provide travelers? Well, family-friendly activities to start. 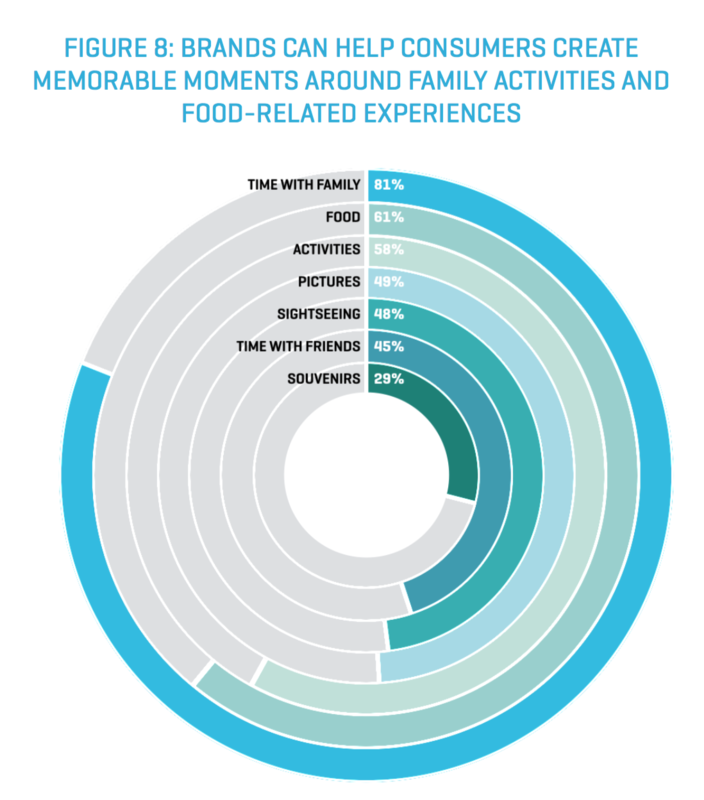 But surprisingly, travelers ranked food experiences as their second most memorable moments. When it comes to communicating with travelers at a destination, the best medium depends on context. Our research revealed that 84% of travelers are open to receiving text messages from hotels with check out time, WiFi usernames and passwords, menu specials, etc., while 67% are likely or very likely to use chat services or texting with airlines or hotels. For transactional conversations like these, a text, chat or emoji will suffice. However, a whopping 76% of surveyed individuals believe that human interaction throughout travel- provided services is important or very important. 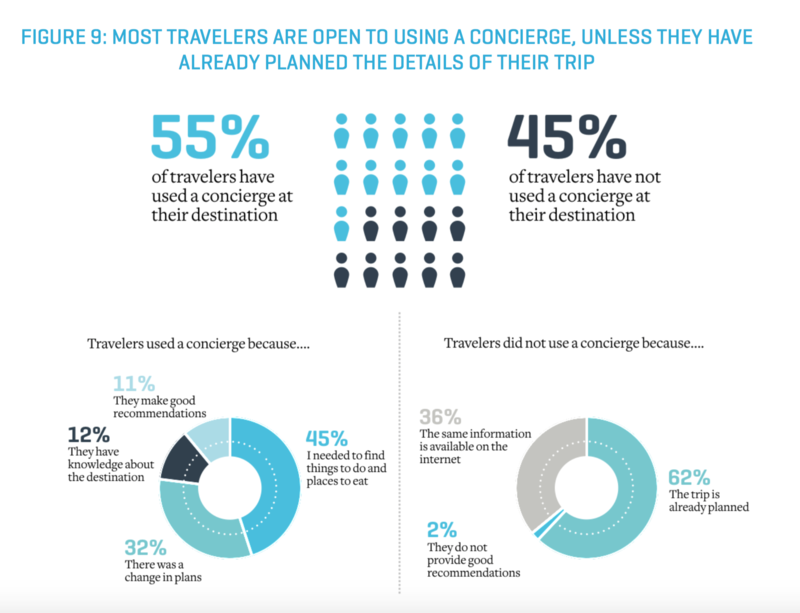 While the majority of individuals (55%) have used a concierge when at their destination, the remaining 45% who did not felt they didn’t need one or that they could find the information they needed on the internet. Of those who have used a concierge, most prefer to have conversations in-person, not digitally. When we spoke to travelers, many of them reflected positively on the times they had one-on-one conversations with their Airbnb host and received local – not touristy – recommendations. It’s important for travel brands to understand when they can interject during a trip, when to emphasize in- person conversations, and when a text will be more well- received. Travelers welcome useful suggestions fro brand that prompt them to be more spontaneous. For transactional communication, digital will suffice. However, for personalized concierge servies, most travlers perfer in-person.